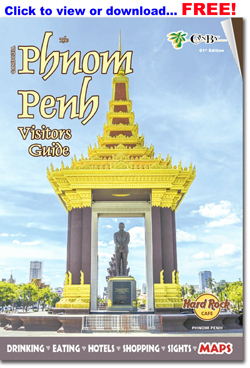 Phnom Penh offers a fairly steady stream of parties, art exhibitions, live music, openings, cultural events and such. 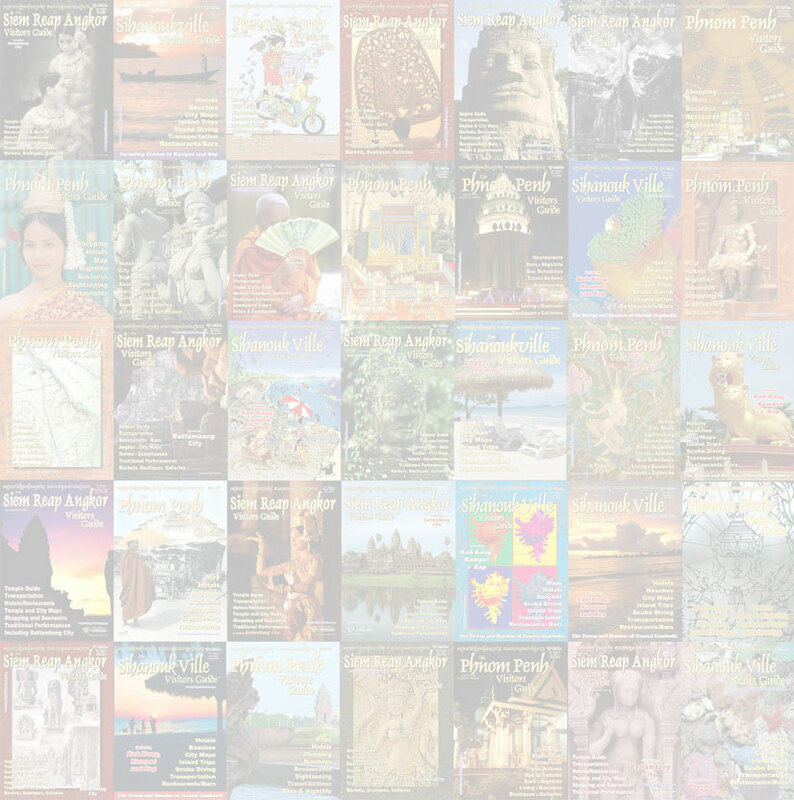 For the latest information on up-coming events there are several print publications floating around, including monthly magazines Asia Life (parties, cultural events, exhibitions, concerts) and Bayon Pearnik (pub crawls, music, parties and fun stuff) and few weekly mini-magazines such as 7 Days by the Phnom Penh Post. An international performing arts production company working to promote and sustain the revival and preservation of traditional Cambodian performing arts. Events, lectures and exhibitions. Le Cinema hosts French films at 6:30PM every few days. Watch for monthly event schedule brochures. #214, Street 184, Phnom Penh, Cambodia. A café set in an exhibition space, offering regularly changing exhibitions showcasing contemporary artists. #56 E1, Sihanouk Blvd., Phnom Penh, Cambodia. Art and media gallery hosting regularly scheduled events in the arts - exhibitions, films, panels and lectures. Kingdom Breweries (Cambodia), the producers of the premium beer Kingdom Pilsner, offers regular tours of its brewery facilities just north of the city. Kingdom Breweries in Phnom Penh has been in operation since 2010 and Kingdom Pilsner is available at bars and restaurants throughout Cambodia. Enjoy a complete tour of the brewery and stop in a the brewery bar, the Taproom overlooking the Tonle Sap River for a Kingdom Pilsner and Visitors are welcome to check out how the most premium Cambodia beer is made as brewery tours can be arranged and get to enjoy the Kingdom's pride at the brewery's Taproom. Located at #1748, National Route #5, Russei Keo district, Kandal Province. Tours are available Mon - Sat, 1:00PM-5:00PM. The Cambodia Cooking Class has been running since 2005. Begins with a tour around a local market. At the cookery school itself it's hands-on action. You'll make everything from scratch with fresh ingredients. Classes are held every day on a rooftop terrace. Book through frizz restaurant. Khmer cooking classing by experienced Cambodian cooking teachers at Feel Good Cafe. Featuring a trip to a traditional market to shop for ingredients. In class, individual cooking stations. Also offering Evening Street Food Tours. Well-reviewed Cambodian cooking classes in Boeung Keng Kang 1 (BKK1) at La Table Khmere restaurant. Daily, half-day classes, morning and afternoon, including a trip to the market and hands-on preparation in a modern kitchen environment. In addition to hosting regularly scheduled traditional performances, Sovanna Phum Art Association also offers workshops in traditional Khmer arts such as Shadow puppet making & performing, classical & folk dance and how to play Khmer traditional music instruments. Private classes in the art of shadow puppet making are available on request. Most of the major hotels have gyms offering complete, modern facilities. For early risers, every morning at the crack of dawn people congregate in the park in front of the Royal Palace to jog, walk, stretch, do Tai Chi and calisthenics. Air- con, cardio/weight equipment. Swimming pool. Memberships. Boxing and kickboxing. Instruction, class - es, training. Proper ring, equipment. Indoor climbing, bouldering, classes, workshops, kids activities. Open: 3:00PM - 9:00PM (8:00PM on Sunday); Saturday 8:00AM - 11:00AM, 3:00PM - 8:00PM. Air-con, wieght machines, swimming pool, sauna, steam. All new, five-star gym, state-of-the-art equipment, sauna, Jacuzzi, classes, swimming pool, table tennis, internet lounge. Cambodia offers a limited but slowly growing number of golf courses. The Cambodia Golf and Country Club is the best and most popular 18-hole course in the Phnom Penh area, sitting about 35km from the city. There are now three comparative new courses in and near Siem Reap Angkor in the west of Cambodia. Cambodia's first golf course and the most popular in the Phnom Penh area. 18 hole golf course spread over 120 acres, palm trees, several water features. Clubhouse, restaurant, swimming pool, tennis courts. Equestrian center at the Cambodia Country Club with 30 horses, complete stables, arenas, open riding country. Offering lessons at all levels - basic riding skills, kid’s classes, dressage, jumping, vaulting and pony club for the kids. Lead trails for the kids. Sports club and restaurant. The comparatively new Ice Park Cambodia offers a large, state of the art ice skating rink as well as skate rental and skating lesson. . Both have skate rental and the Ice Park offers skating lessons. and is open 9AM-10PM. Asia State-of-the-art indoor entertainment center for kids of all ages. Ice skating, Science Center, Clip & Climb, Laser Tag, Playground, dining, kid’s clothing shops. The city now sports several modern movie theaters, most in the malls, showing the latest first-runs and blockbusters. The facilities at the major theaters are state of the art - 2D, 3D, 4D, and very comfy VIP seating. There are also a few old school traveler-friendly small community movie houses with regularly scheduled movies, often classics, in a sofa lounge atmosphere, with food and drink available. The movie house sits above The Empire restaurant and bar. Very comfy, 22-seat, fully air-conditioned, sound-proof theater. Chairs, tables, throw cushions and mats, your choice. Showing the classics and the latest movies, afternoons and evenings on weekdays, and an extra matinee showing on the weekends. Enjoy food and drinks from the restaurant/bar, served to you in the theater. One block off the riverfront. Two uber-comfy movie houses offer blockbusters, film festival winners, documentaries and classics in HD quality on the big screen, in a/c movie rooms. The Flicks 1 has a welcoming bar with lounge deck outside. The Flicks 2 can be found next to the 11 Happy Backpackers on Street 136, ready to serve you cold drinks and fine food. The Flicks 3 @ Gasolina is the open air cinema during the dry season, screening movies on the big screen in a big garden. Cover: $3.50/day. See website for the weekly movie schedule and to make reservations. The Flicks 1 Community Movie House: #39B, Street 95, BKK3, Phnom Penh, Cambodia. 11 Happy Flicks 2: #88-89 St 136, riverside, Phnom Penh, Cambodia. Phnom Penh’s first and currently only international standard movie theater playing first-run English language movies. Three movie halls with proper theater seats (including a VIP section), a full size screen, THX sound and 2D/3D capability. Popcorn, soft drinks and candy. See website for current showing schedule. Phnom Penh’s newest international standard movie theater. State-of-the-art theaters. VIP seating. 2D/3D/4DX theaters. International standard movie theater at Sorya Mall playing first-run English language movies. Three movie halls with full size screens and proper theater seats, including a VIP sections. 2D/3D movies. See website for current schedule. The pioneers of diving in Cambodia, providing comprehensive diving and snorkeling services, day trips, live-aboards, nitrox and a full range of PADI courses from beginner to instructor. Flexibility is the key: you can do training sessions while ding sight-seeing in Phnom Penh, then finish with a live aboard on the only custom made diving boat in Cambodia. Mohachai guesthouse, serendipity beach road, Sihanouk Ville, Cambodia. Rooftop infinity pool and bar with city view. 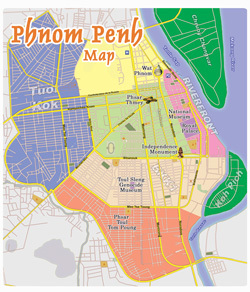 Phnom Penh is a big city and should be treated as such. While not unsafe, it does have its share of big city and developing country problems including chaotic traffic, petty street crime and scams, and limited medical care. * There are regular reports of bag snatching, usually by a passing motorcycle. In tuk tuks keep your bag to the inside and on a moto never wear it on your back. When walking, wear your bag and camera on the shoulder away from traffic. * Both for security, especially at night, and general traffic safety, taxis are better than tuk-tuks and motos. Be aware of your surroundings when alighting your taxi or tuk-tuk. * Blackjack scam: Friendly stranger tells you he likes your glasses, shirt, bag, etc. Casual conversation ensues. Invites you to house to meet family/have cultural experience. Friendly card game begins. Before you know it you owe hundreds or even thousands. * Medical care in Cambodia is limited and the cost of evacuation is exorbitant, exceeding US$20,000. Buy at least enough traveler’s insurance to cover evacuation/repatriation.